"Will become the gold standard for the assessment and treatment of anxiety...."
David A. Clark, PhD, is Professor of Psychology at the University of New Brunswick, Canada. 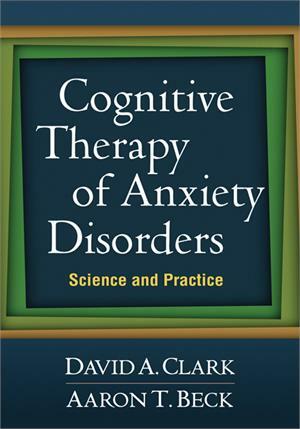 He has published seven books, including Intrusive Thoughts in Clinical Disorders: Theory, Research, and Treatment; Cognitive-Behavioral Therapy for OCD; and Scientific Foundations of Cognitive Theory and Therapy of Depression, as well as over 100 articles and chapters on various aspects of cognitive theory and therapy of depression and anxiety disorders. Dr. Clark is a Fellow of the Canadian Psychological Association, a Founding Fellow of the Academy of Cognitive Therapy, and a recipient of the Academy’s Aaron T. Beck Award for significant and enduring contributions to cognitive therapy. He is an Associate Editor of the International Journal of Cognitive Therapy and maintains a private practice. Aaron T. Beck, MD, is University Professor Emeritus of Psychiatry, School of Medicine, University of Pennsylvania, and the founder of cognitive therapy. He has published more than 20 books and over 540 articles in professional and scientific journals. Dr. Beck is the recipient of numerous awards, including the Albert Lasker Clinical Medical Research Award, the American Psychological Association Lifetime Achievement Award, the American Psychiatric Association Distinguished Service Award, the Robert J. and Claire Pasarow Foundation Award for Research in Neuropsychiatry, and the Institute of Medicine's Sarnat International Prize in Mental Health and Gustav O. Lienhard Award. He is President of the Beck Institute for Cognitive Behavior Therapy and Honorary President of the Academy of Cognitive Therapy.